Instructions: This is a simple game with simple rules. Just trap the cat within the matrix of circles. This is one smart cat though. This game can be done. It is difficult to say the least. After a few plays you’ll start to build a strategy… and just when you’re about to get the cat, the cat will slip away. The Circle the Cat game is addictive to say the least. Be careful! Controls: Just click on the lime green circles and they will turn to a dark green. The cat is blocked by these dark circles. 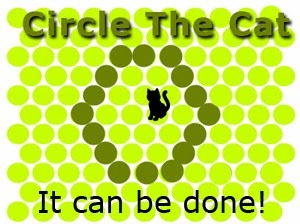 Circle the cat with the dark green circles.